Tom Kelly (left) and William Pitcher (right) are both students at the University of Manchester and we are in our 4th and final year of an MPhys degree in Physics and we will both be graduating in July of this year. The picture was taken as part of our 4th year project, which is aimed at studying the effects of mixing ferrofluid with liquid crystal and observing what happens when a magnetic field is applied and how the ferrofluid changes the properties of the liquid crystal. We are doing the project under the supervision of Dr. Ingo Dierking. The picture is the result of heating a planar cell containing the nematic liquid crystal pentylcyanobiphenyl (5CB) from room temperature at 2 degrees celsius/min to find the transition temperature of the liquid crystal. The picture was taken when the crystal was at 38.7 degrees celsius and exhibits the schlieren texture observed in nematic liquid crystals. The texture shows dark bands, which corresponds to the orientation of the liquid crystal becoming extinct. The bands meet at points called defects with strengths +1,-1,+1/2 or -1/2. Where 4 bands meet indicates a defect with strength +1 or -1 and where two bands meet indicates a defect with +1/2 or -1/2. The colour spectrum arises from the glass plates of the cell not being perfectly aligned. The picture was taken through cross polarisers and has an area of ~57x43 micrometers. 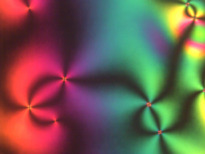 Jury comment: The simplest beautiful pattern in liquid crystal: colors and defects!